This condo is an end unit with 3-bedrooms (each has a flat screen TV) plus 2.5 baths, spacious enough and full of light. A fully stocked kitchen that lets you have meals at home when you are in the mood or if you do decide to go out, you are in the middle of renowned Restaurant Row. 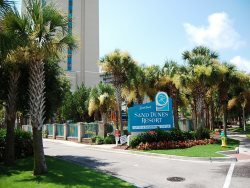 You are also very close to golf courses, Tanger outlets, boutiques, ice cream/yogurt parlors, pubs, mini golf, and the famous Ocean Annie's - YOU WILL NEVER RUN OUT OF THINGS TO DO - day or night. Up to date condo with 4 Cable TV's, Wi-Fi, DVD, wet bar and a screened-in porch, w/ a Washer/Dryer so you can pack light and a large fold out couch means it easily sleeps 8. Come and build memories in #322 at Pelican's Watch.